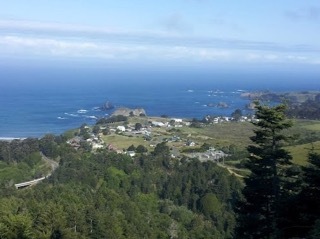 THPBlog: Mendocino Redwood Company planning a THP near Elk, CA. Mendocino Redwood Company planning a THP near Elk, CA. This THP is about 4 mi SE of Elk, CA and Highway 1 at an elevation of 1,120 to 1,800 feet. Mendocino Redwood Company is planning a tractor and cable logging operation on steep and unstable slopes in redwood, Douglas fir and grand fir forests. There are 3 landslide terrain sites near an old scarp and existing road, near an existing road and spring, and on hummocky grounds. Ground based equipment is proposed for use on landslide terrain, on steep slopes over 65% grade, and on slopes over 50% grade with a high or extreme erosion hazard. An existing road and landing are also proposed for use inside a class II (mid-sized) watercourse. 13 road drainage sites will require work including rocking, dip construction, ditch cleaning, and culvert repair/replacement. More information is available on the THP Tracking Center website.